Cool northerly winds from a recent frontal passage blow over the warmer waters of this Florida river. Wispy smoke like fog rises in the early morning light. Fall is quickly beginning to wane and soon we will see winter like weather in the Sunshine State. Had to call the gas company to do the annual prep of the fireplace for winter. I have to be able to keep the Editor warm on these cold mornings. Do you feel sorry for me yet? Yes, winters are really tough here in Florida. Today I began to see more signs saying winter is near. The first Brown Pelican of the season landed right next to the Lizard Lounge dock. Most of the birds captured lately are all blue or white. The Editor loves to collect Blue and White pottery and dishes. I love to capture the blue and white birds on the Broward, I.E. the Great and Little Blue Herons and Great and Snowy Egrets. Old Man River, the Great Blue Heron still will not let me get a close photo. The Snowy Egrets have returned in numbers and provide some great early morning opportunities. 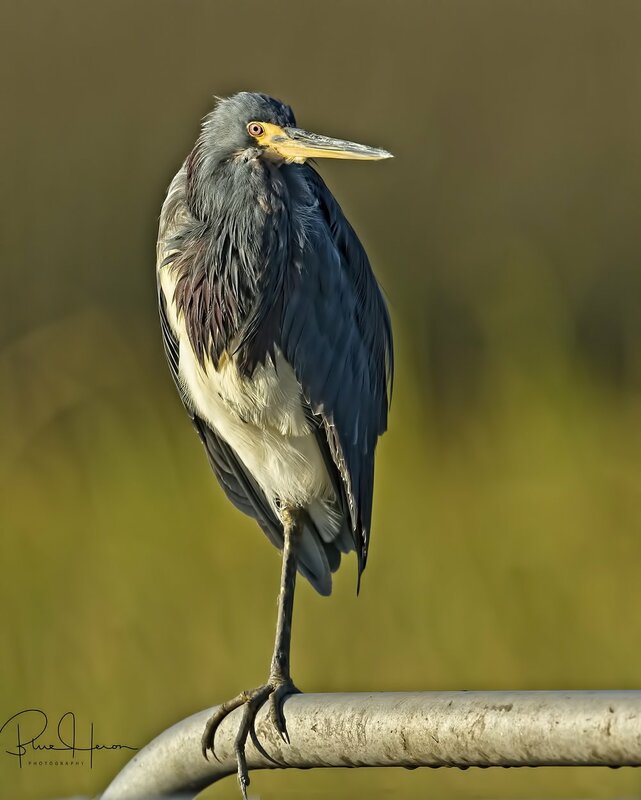 Mature and juvenile Little Blue Herons provide most of the recent photo opportunities. Hope you enjoy the parade of Blue and White today. Seeing blowing Snow(y) Egrets on the Broward, a sure sign of winter.. This Little Blue Heron glides over the Broward..
Little Blue Heron fly by..
Got this cute little Palm Warbler on the fence,,,it isn't blue or white though.. Some cormorants are making their Broward debut also.. I am not one for the limelight. I prefer my life to be quiet and low key. But sometimes I open my mouth and get in trouble. That is why I spend lots of mornings on the dock talking to my maker and making amends. I also love this time of year for low key photography to go with my low key lifestyle. One of my instructors once commented on one of my photos as being a good example of a high key shot. I had no clue what he was talking about so I had to do some homework. Per one on line source “When a photographs light is exaggerated to the bright end of the spectrum it is called "high key" photography. When it is slanted to the dark end of the spectrum it is called "low key" photography.” White birds against a dark background as found in some of my 24 October 2016 Reflections are excellent examples of the latter. 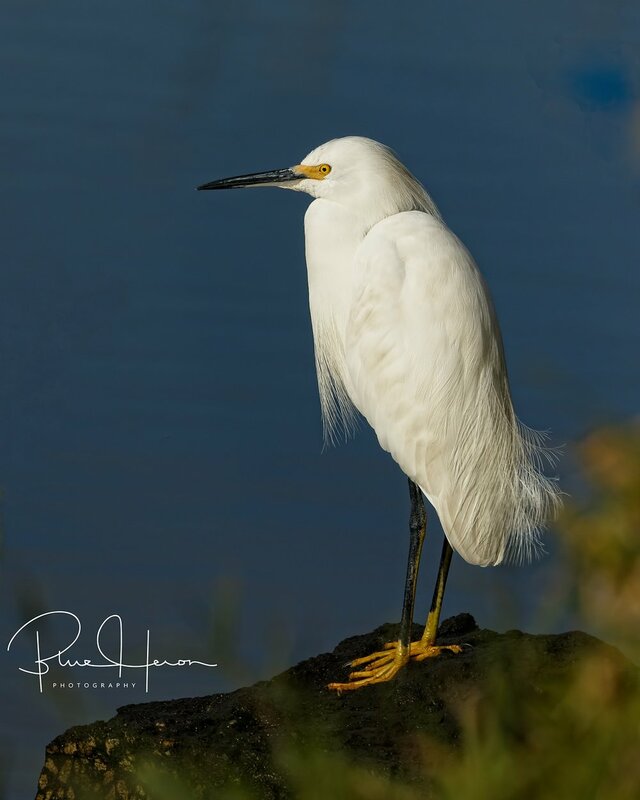 Recently a Little Blue Heron and a Great Egret provided me some great low key opportunities. Hope you enjoy them. When a photograph is slanted towards the dark end of the spectrum it is called "Low Key". White birds on a dark background make excellent low key opportunities.. I guess that make me "Middle Key" then! So I guess I will just sing "Off Key"
Blustery northwest winds are blowing over the Broward. Temperatures have dipped into the low 40s in the predawn hours. Alas, winter is not yet nigh though. The forecast for the coming week is again in the upper 70s. Sure is nice to be Florida this time of the year. What is nicer is that I am munching on my stash of Reeces cups too. I look up to see an Eagle screaming overhead. Unfortunately, this is a Florida Air National Guard F-15 Eagle. Not the feathered kind I had hoped for. A Tricolored Heron chases minnows in the outgoing tide and captures a nice fat one for a morning snack. 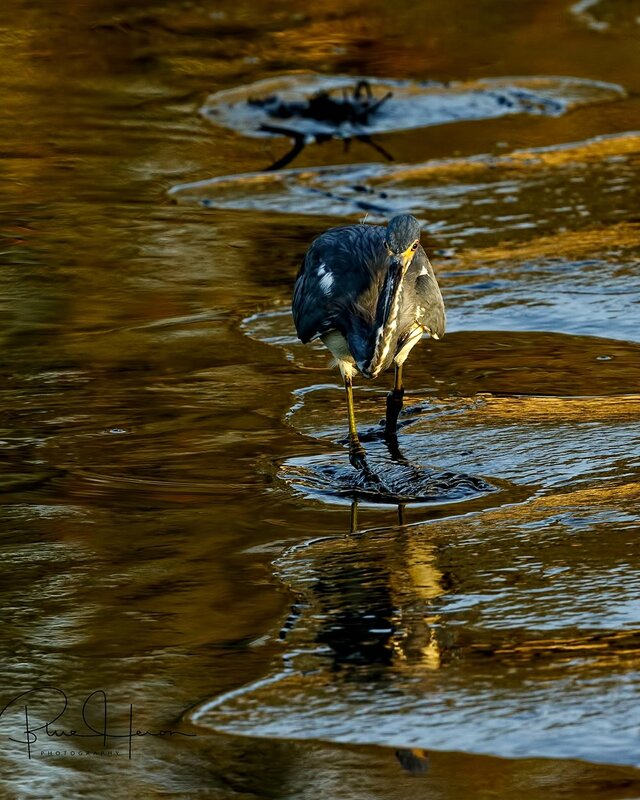 Golden rays illuminate the juvenile Little Blue Heron as it wings by. An adult Little Blue also glides by overhead. I look over at the neighbor’s yard and spot a Red-shouldered Hawk taking a morning bath in the flooded yard. Shortly afterwards another Red-shouldered Hawk lands on the fence and stares at the bathing bird below. Seems I remember a story about a young ruler looking down on his neighbor’s wife bathing and had some not so pure thoughts. One thing then led to another. I think I shall call this pair Dave and Sheba from now on. Red-shouldered Hawks live year-round on the Broward. This particular mating pair have been observed as long as I have been making a record. One of my recent encounters with this hawk was when it snatched a young squirrel from a nearby tree and flew off for a lunch date. Per the Cornell laboratory of Ornithology “Adults are colorful hawks with dark-and-white checkered wings and warm reddish barring on the breast. The tail is black with narrow white bands. Immatures are brown above and white below streaked with brown. All ages show narrow, pale crescents near the wingtips in flight.” Like most hawks the female is usually a bit larger than the male. 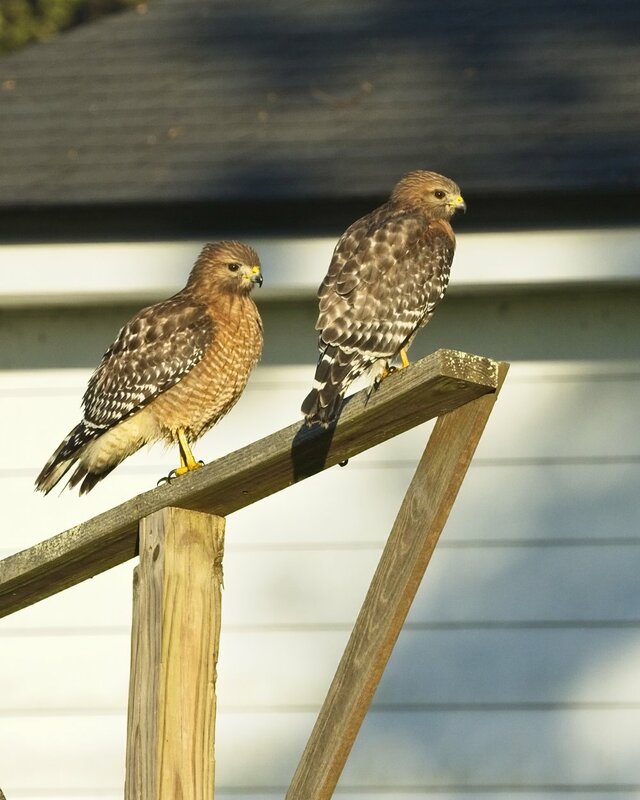 The oldest-known Red-shouldered hawk was a female, and at least 25 years, 10 months old when she was recaptured and rereleased during banding operations in California in 2000. Can you believe November is here? Time to think about pumpkin pie, turkey and dressing and seeing family and friends. Take time to see them, it is worth it. Blessings. A Florida Air National Guide F-15 Eagle screams overhead..wrong kind of eagle..
Juvenile Little Blue Heron (born white) in the early morning light. Great Egret lights up the morning..
Sheba, the Red-shouldered Hawk takes a morning bath..
You should be ashamed of yourself Dave! Dave is the proverbial dog house now.